The Asia Society memorial was the second of three events held in the New England area over the span of a week honouring the renowned human rights lawyer. At a time when universal fundamental human rights values are under attack from fascist forces everywhere, an enduring lesson from Asma Jahangir remains: do your homework, stand your ground, and carry on. “She wasn’t someone who was just writing reports, which is what I do. I’m not on the frontlines. Asma was,” said UN Special Rapporteur and NYU Law School professor Philip Alston, speaking at a memorial meeting in New York last weekend. The loss of her passing on February 11 continues to reverberate. The late former UN Secretary General Kofi Annan was to have been keynote speaker at the event at Asia Society on September 30, 2018. However, he too passed away barely a month earlier. Members of what I call Asma’s tribe filled the over 250-seater auditorium – her friends and family members, plus activists and followers not just from Pakistan but India, USA, UK Iran and elsewhere, people who believe in her vision of fundamental human rights. Many had travelled from Toronto, Los Angeles, Washington D.C. and elsewhere to join the memorial. Coincidentally, these events took place just ahead of the first Asma Jahangir Conference (#AJCONF2018) held in Lahore this weekend, October 13-14, 2018, organised by AGHS Legal Aid Cell and the Supreme Court Bar Association of Pakistan. In 2010, Asma Jahangir was elected as the first female President of the SCBA, a victory that gave her more satisfaction than all her international accolades and recognition. A host of human rights and legal luminaries from around the world had confirmed their participation at the Lahore conference, which aims to celebrate Asma Jahangir’s vision and legacy. Fittingly, participants will discuss strategies to promote justice by “strengthening the rule of law and democracy, protection of fundamental rights, strengthening the independence of the judiciary and mainstreaming gender”. At the Asia Society, Lyse Doucet, BBC’s chief international correspondent, deftly moderated the discussion, inserting her own lively memories of Asma Jahangir as a friend and “co-conspirator for human rights”. “Asma’s vision crossed borders,” she said, turning to Philip Alston to ask what it was like after Asma joined the UN. Alston had met Asma Jahangir and her sister Hina Jilani in 1984, but really got to know Asma when they both served as United Nations Special Rapporteurs on extrajudicial killings. There was another difference between him and Asma, he said. Asma “was civilised,” said an assistant who worked with both of them. On a serious note, Alston brought up two of Asma Jahangir’s most critical contributions to the human rights discourse. In 2003, it was she who first picked up the use of drones as a human rights issue. Later, she “single-handedly” put sexual orientation on the human rights agenda simply by including it in her report. 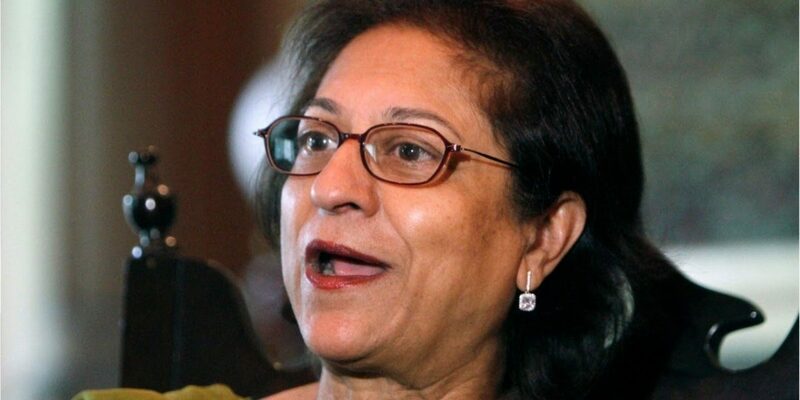 Ayesha Jalal, historian and Asma Jahangir’s old friend from Lahore, termed Asma a “maverick” who put human rights on the map in Pakistan and changed the national discourse and challenged the military narrative. She could do so, stressed Prof. Jalal, because “she did the homework, which was political” not based on rhetoric. She misses her friend on a personal level and also politically – Asma Jahangir’s departure has left a “loud silence”. Speakers included Asma Jahangir’s sister and AGHS Legal Aid Cell co-founder Hina Jilani, Open Society Foundation’s founder George Soros, International Crisis Group’s Samina Ahmed, and prominent journalists and authors Steve Coll and Ahmed Rashid. Many from the audience also shared their memories. Asma Jahangir’s older daughter, television journalist Munizae Jahangir showed a brief documentary highlighting some cases taken up by AGHS. Most of the lawyers have worked there for 20 or more years, staying on despite more lucrative offers. The day after Asma’s passing, they all showed up at the office. The Asma Jahangir Foundation set up by her family aims to continue supporting their work. Peppering her talk with anecdotes, Munizae recalled childhood memories of the 1983 women’s protest in Lahore when her mother was arrested – the children got their first whiff of teargas. Ten years later, the Salamat Masih ‘blasphemy’ case propelled Asma into the limelight and into the crosshairs of the religious extremists. The family came under attack too “and we all suffered”. Why she was doing this? Asma had explained to her children that Salamat, 12, was the same age as her son. He urged Asma not to defend him saying, “Let me hang, to save the rest of my family, let me be the sacrificial lamb”. Behind this case as with most such allegations, was a property dispute. How could she not help him? At the court hearings, Asma Jahangir was surrounded by protestors chanting ‘death, death, death to Asma’. “In the middle of all this, five foot nothing, she stood firm, and finished her arguments”. Then a newspaper ran a front-page story headlining the accusation of ‘blasphemy’ against her. Asma Jahangir piled her three children into the car along with their nanny and drove to the newspaper owner’s house where she left them. “She called up the media baron and said, since you have given my name and my life is under threat, you may as well start looking after my children because I’ll be killed”. The newspaper ran her version the next morning. “To me she was almost like an Indian film hero. You know that right now he’s down and out, but he will fight back, there will be this music and he will be back, there will be a plan”. The second event honouring Asma was a seminar at the Fletcher School of Law and Diplomacy at Tufts University on September 25, hosted by Ayesha Jalal, on “Democracy and Human Rights in South Asia: Commemorating Asma Jahangir’s Life and Legacy”. Featured speaker Nobel Laureate Amartya Sen could not make it to Tufts due to illness. He and Asma shared a longtime friendship and he had spoken at the Celebrating Asma event members of her tribe organised at Harvard University on February, Amartya Sen had read a paper later published as an opinion piece in The News and elsewhere, Asma Jahangir, my fearless friend. Barely a year earlier, in January 2017, Asma Jahangir had delivered the inaugural Amartya Sen Lecture, Religious Intolerance and its Impact on Democracy, at the London School of Economics. The third event honouring Asma was at the Crisis Group’s ‘In Pursuit of Peace’ gala dinner on October 3, 2018 in New York. “It is critical to honour Asma’s legacy …to work wherever human rights are systematically threatened,” said Alexander Soros of the Crisis Group. “During her 16 years on our Board of Trustees, she constantly highlighted to us that injustice is both a cause of violent conflict and one of its greatest and most enduring costs”. The ICG also announced a new Asma Jahangir Analyst Position, “to serve as a tribute to Asma and her commitment to justice”. The position will be filled by a young analyst working on conflict and human rights in South Asia, Myanmar, Venezuela, Burundi or elsewhere. The Group hopes to help “empower the next generation of human rights defenders to continue and build upon Asma’s legacy”.